Dysmenorrhea is pain during menstruation, the kind that is so severe it interferes with daily activity. As many as 80% of young adolescent girls complain of severe cramps and pain during their period cycles. Nobody deserves to be in so much pain for a whole week every month, especially young girls for something they have no control over. If you are exhausted and your body cannot endure this disabling pain any longer, you may want to consider alternative medicine in the form of acupuncture, as a safe and healthy method of managing your condition. Not every woman experiences the same symptoms in the same way. The one common factor is always unbearable pain right before, during, and just after menstruation. Most gynecologists fail to diagnose Dysmenorrhea correctly, and even if they do, the most they can do for the suffering woman is prescribe powerful painkillers and NSAIDs, or oral contraceptives like birth control pills. These do nothing but flood the body with chemicals and create a toxic environment for you. They also alter your hormonal make-up and induce unnecessary side-effects that just add more discomfort to your condition. These pills, chemicals, and hormones offer a temporary solution to a permanent problem, and you will have to administer these drugs to help you manage the pain throughout your reproductive life. In addition to being harmful, these drugs eventually build up a tolerance in your system, and you need more and more in order to feel their effect, which creates a vicious cycle of dependence and toxicity. This is why more and more women are opting for an alternative solution, and trying acupuncture therapy. When compared to chemical or surgical intervention, acupuncture is a safe, healthy, and non-invasive method for effectively treating your condition. Acupuncture allows for energy to pass the main meridians and pathways of the body, allowing it to release endorphins and other hormones associated with healing. The resulting biochemical changes influence the body’s homeostatic mechanisms and the stimulation of certain acupuncture points reduce sensitivity to pain. All this means that the symptoms of Dysmenorrhea are better managed without polluting the body with unnecessary chemicals. Studies have shown that acupuncture treatment for Dysmenorrhea leads to reduced sensitivity to pain, and regular period cycles with normal flow and lack of blood clots. Slight cramps are normal and expected, but acupuncture will alleviate the kind of pain that renders one incapable of going about daily functions. At our center in Aventura Florida, we believe in a combination of eastern and western medicine to help you receive the best of both worlds. 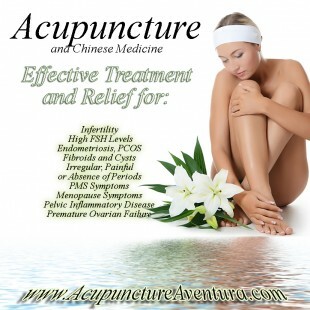 Acupuncture therapy has no adverse affects for your body, and can help maintain perfect reproductive health. To make an appointment, call us at (786) 537-7022 and we can begin your treatment immediately. Insurance is accepted.